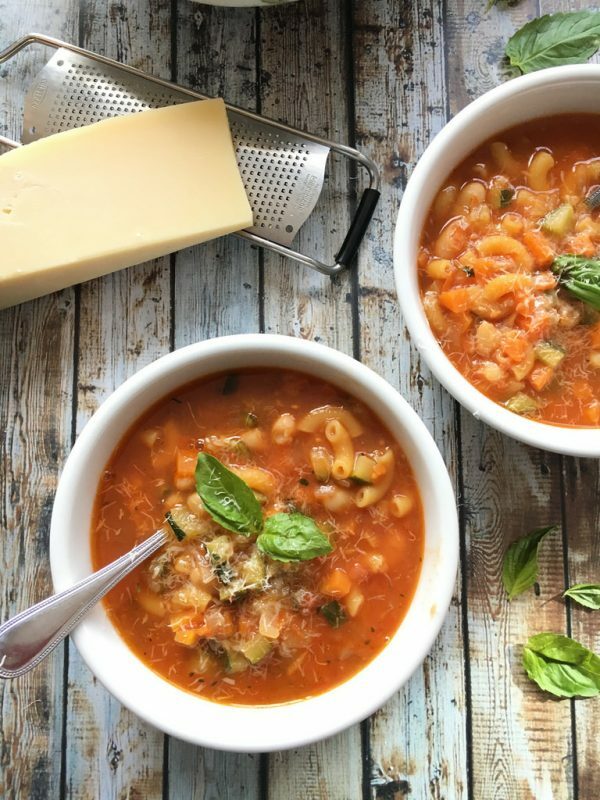 This hearty recipe for Macaroni Minestrone Soup is a one-bowl meal brimming with kid-friendly elbow pasta and three vegetables—zucchini, carrots, and fiber-filled canned beans. Every satisfying slurp is guaranteed to go down with a smile. 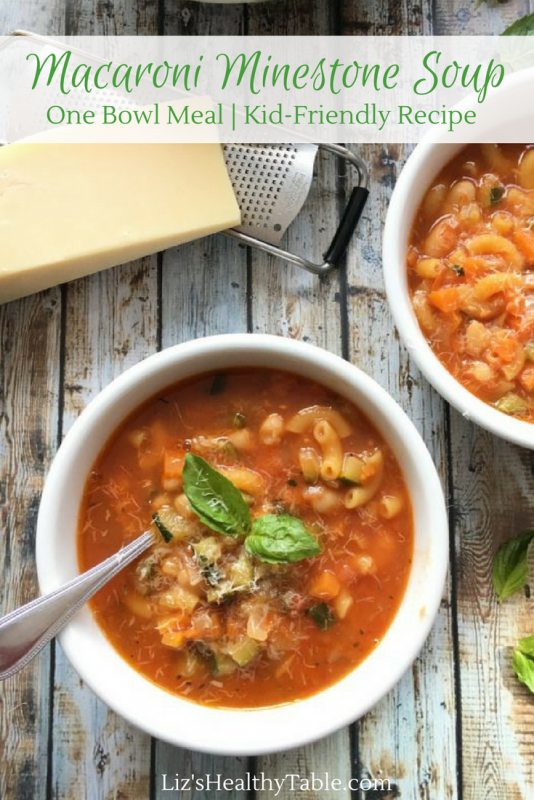 My Macaroni Minestrone Soup celebrates all that’s great about the Mediterranean diet, an eating style that includes fruits, vegetables, olive oil, and whole grains, as well as nuts, seafood, cheese, and eggs. The Mediterranean diet recently tied for the number-one BEST diet for 2018 by U.S. News and World Report because of it’s ease, deliciousness, and health benefits. 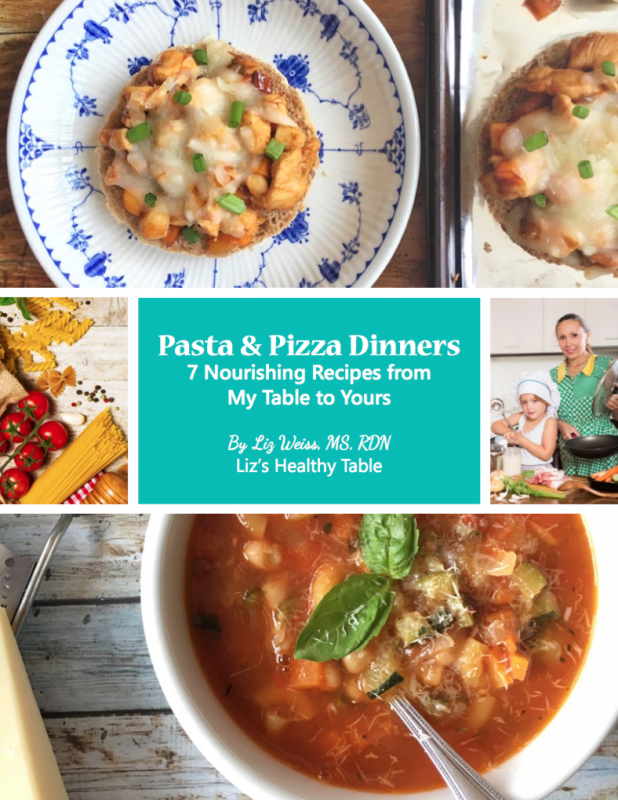 Kids who like alphabet soup and other vegetable/pasta soup combinations will love my pasta-filled version of minestrone soup. But it’s not just the familiar elbow pasta that appeals to kids. It’s also the way I dice the zucchini and carrots into small, cute pieces to minimize the intimidation factor. I recommend you use whole wheat pasta for this recipe. Since half of your grains should be whole grains, switch from regular macaroni to whole wheat. The slightly brown color of the pasta will blend right in. In other words, your kids won’t notice the difference. A word on grains: While the Mediterranean diet is one of the most popular eating plans out there, chosen for its versatility and flavor and its’ many health benefits including weight control and improvement in cholesterol levels, grain foods like bread and pasta often get a bad rap. 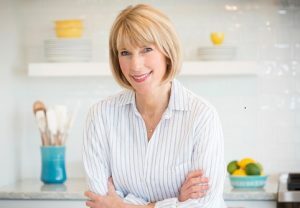 Last month, I attended a sponsored food and nutrition conference in Lisbon, Portugal where one of the scientific sessions focused on debunking myths about grains. 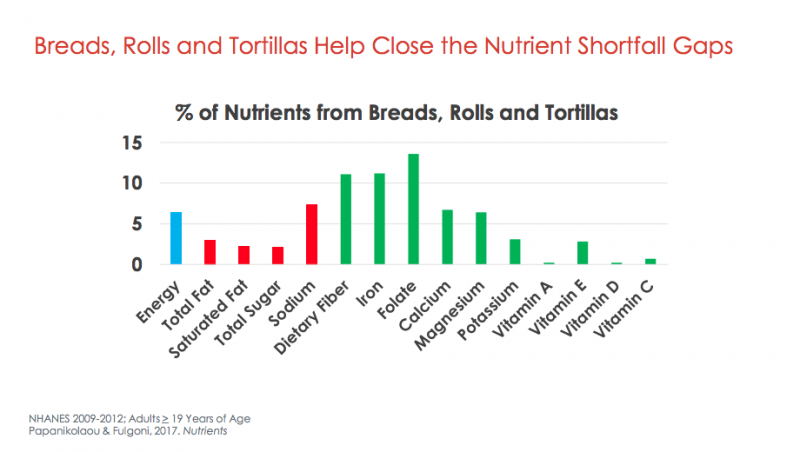 An important takeaway from research presented by Yanni Papanikolaou, MHSc, Vice President, Nutritional Strategies, Inc. was that grains are nutrient dense and contribute to DGA (Dietary Guidelines for Americans) 2015 shortfall nutrients, including fiber, iron, folate and magnesium. So use whole grains to your advantage to boost the versatility, health and appeal of your meals. 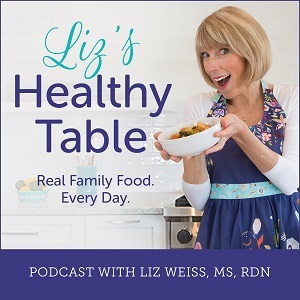 Something else to keep in mind when making this soup: Any kind of tiny pasta shape works well, including one of my favorites: whole wheat orzo. And the same can be said for canned beans. You can easily make the switch to chickpeas or pinto beans if that’s what’s on hand in your pantry. 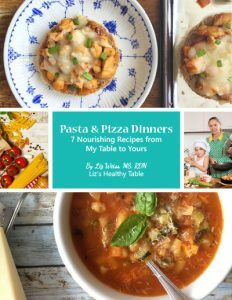 For more pasts and pizza recipes, download my FREE e-book, Pasta & Pizza Dinners: 7 Nourishing Recipes from my Table to Yours. We're a soup-loving family, and minestrone soup is a regular at my table. We never tire of it. It's even a favorite in summer when when I'm looking for ways to use up fresh basil, zucchini and summer squash. 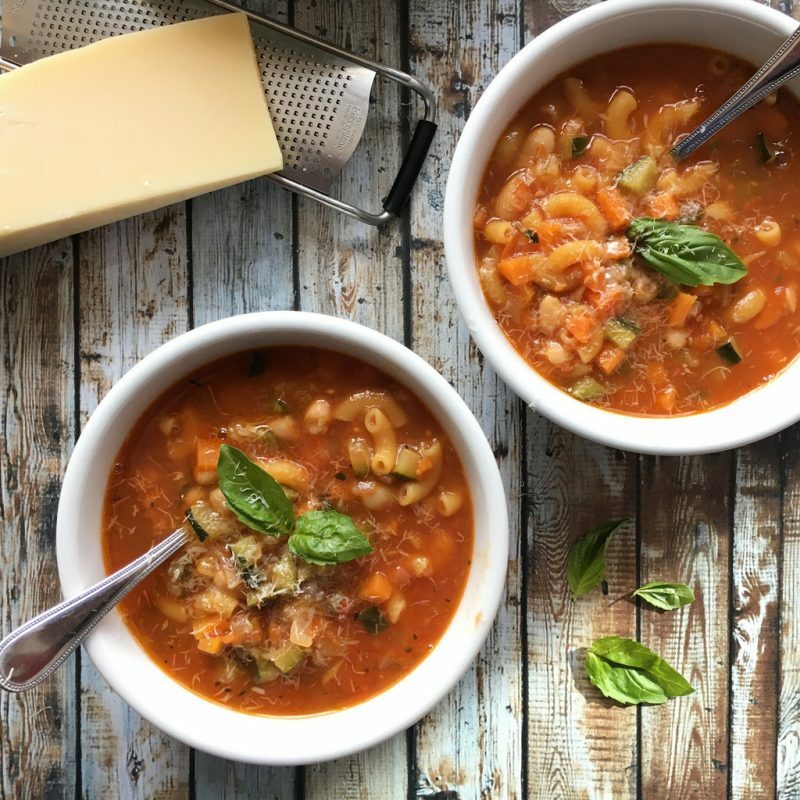 And with 7 grams of fiber thanks to the beans and whole wheat pasta, 60% vitamin A, and 35% vitamin C, this hearty soup will keep you and your family well nourished all year long. Heat the oil in a large Dutch oven or saucepan over medium-high heat. Add the zucchini, carrot, onion, garlic, and thyme and cook, stirring frequently until the vegetables soften, about 12 minutes. Reduce the heat if the vegetables brown too quickly. Stir in the broth and tomato sauce, cover, raise the heat, and bring to a boil. Add the beans and pasta, reduce the heat, and cook at a low boil, uncovered, until the pasta is done, about 10 minutes. Stir a few times as you go; some of the pasta may stick to the bottom of the pot. Season with salt and pepper to taste. Serve in individual bowls and top with the Parmesan cheese and basil as desired. 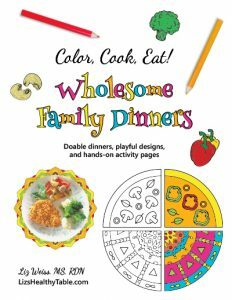 Have you ever made minestrone soup for your family? Do they love it? What veggies do you add? Just made this with some fresh garden zucchini. I added only 8 ounces of tomato sauce and added a 15 ounce can of diced tomatoes. I also added about one cup chopped cabbage. Yum!! !